Don't panic: it is no rude awakening and nobody will be torn to pieces - the dynamite bars consists of paper-wrapped wooden poles and wake up is done with a speaker. But of course, in the current climate of omnipresent terror panic this thing is still completely unsuitable to be positioned somewhere in public space. and some analog accessory parts. A mains adapter from an mobile acts as power supply. A button cell buffers the real time clock in case of power outage to keep the set alarm times and to continue the clock. 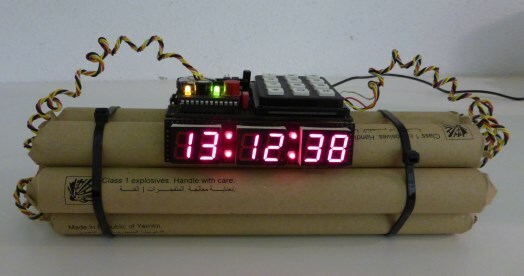 To achieve a conceivable impression, a few (non-functional) wires lead from the electronics to the dynamite. The alarm times and the clock are set by using the matrix keyboard. Twenty seconds before the set alarm time the count down starts. Within this time, you can press on the red button to delay the alarm time by 8 minutes and to continue sleeping. But if the 20s elapse, all hell brakes lose. Video cannot be shown. It seems your brwoser does not support HTML5 videos. 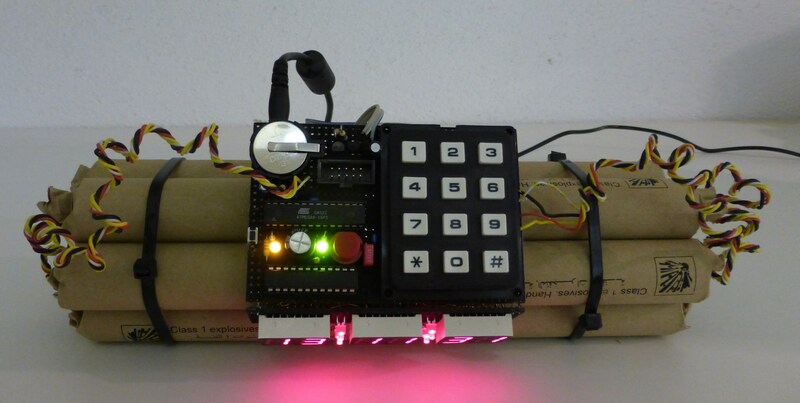 In proper style as it should be for such a bomb: to defuse the alert, enter code 007 on the matrix keyboard. This is no real bomb - just an alarm clock which looks like that. There are no explosives here. There are no gunpowder plots here. There is no risk for the population. Please go on. There is nothing to see.